Attention Windows NT/2000/​XP/​2003/​Vista/​2008/​7/​8/8.1/​10 users: R-Studio Agent should be installed under an administrator account. 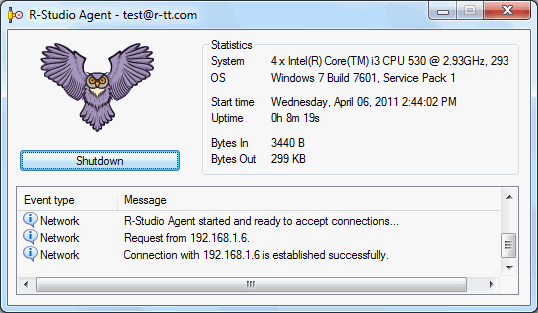 When installed, R-Studio Agent starts automatically and runs as a service. 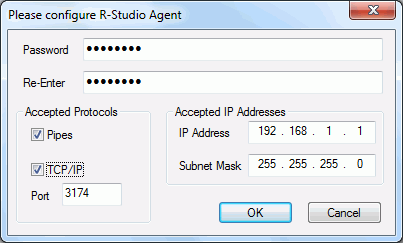 To configure it, R-Studio Agent should be started again manually. Started without a switch, R-Studio Agent runs as a GUI application and its icon appears on the taskbar tray. In this mode, it can be configured and its log may be viewed. Simply connect to the remote computer providing a desired password for R-Studio Agent in the Connect to Remote Computer dialog box. R-Studio checks if there is R-Studio Agent running on this computer. If not, a Can't connect... message will appear. Click the Yes button, and R-Studio will remotely install R-Studio Agent . Attention Windows NT/2000/​XP/​2003/​Vista/​2008/​7/​8/8.1/​10 users: R-Studio Agent may be remotely installed over a network from a computer running Windows NT/2000/​XP/​2003/​Vista/​2008/​7/​8/8.1/​10 to another computer running Windows NT/2000/​XP/​2003/​Vista/​2008/​7/​8/8.1/​10. To do so, you must have administrator accounts on both computers. supported by Windows NT/2000/​XP/​2003/​Vista/​2008/​7/​8/8.1/​10 only. To improve security, this option should be disabled.